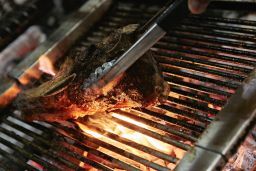 Following the immense success of their first solo venture temper Soho, which opened in November 2016, barbeque expert Neil Rankin and business partner and Managing Director Sam Lee will open their second site in Angel Court in the City this summer, specialising in gin, top quality wines from the New World and curry cooked on their signature open fire pit. As with temper Soho, fire and wine will be at the core of temper City. The music, vibrant atmosphere, smoke and theatre of the open kitchen will also be central to the temper City experience. Meat will be cooked ‘low and slow’ over oak and charcoal using unique smoking techniques developed by Neil. The menu at temper City will change regularly and focus on curry. The eclectic menu will include a breadth of dishes with no geographical boundaries; with the likes of Mutton rolls and Laksa lamb belly stovies to start, alongside curries such as the Lamb scotch bonnet vindaloo, Dry goat (similar to a rich and tender Malaysian Rendang), Meatball marrow masala, Dashi chip shop chicken (a chicken stock based thick curry with dashi and spices, poured over temper smoked chicken) and Crispy egg with katsu. The soft launch at temper City will run from 24th July until 29th July with 50% off food.